Many businesses are reported to have lost most of their profit during the prolonged bear market, some of them even decided to cut down by terminating employees or even shutting down the business completely. Is mining crypto these days really that unprofitable? There's no one correct answer to the question as it can't be generalized. According to Mineable, it completely depends on the mining location since factors, such as electricity cost is very crucial. In fact, it can even be considered as the “make or break it” aspect in such business. Of all the countries in the world, Venezuela is said to be the crypto mining haven due to the fact that it has the lowest electricity rate in the world, with only $0.002 per kWh. To give an idea of how “cheap” that is, in the US, it costs about 12 cents per kWh, while in the Europe it varies from 9.6 cents per kWh like in Bulgaria to 30.5 cents in Denmark and Germany. The number also means that one can mine 1 BTC with less than 600 USD cost. There’s a catch, though to that captivating low electricity cost. Venezuela is one of the countries that haven’t been very welcoming to mining businesses. As a matter of fact, reports on miners being arrested with fabricated charges have happened multiple times, with the most recent one happened in 2017. Unclear regulation combined with corrupt government are said to be the “excuses” to such unfortunate incidents that befell Bitcoin miners in the country. In some other places, some people can still make profit from mining Bitcoin, even when it's valued below $3,000. In Ukraine, Uzbekistan, Trinidad, Kuwait, Myanmar, and Belarus, it “only” costs $2,000 to generate 1 Bitcoin. 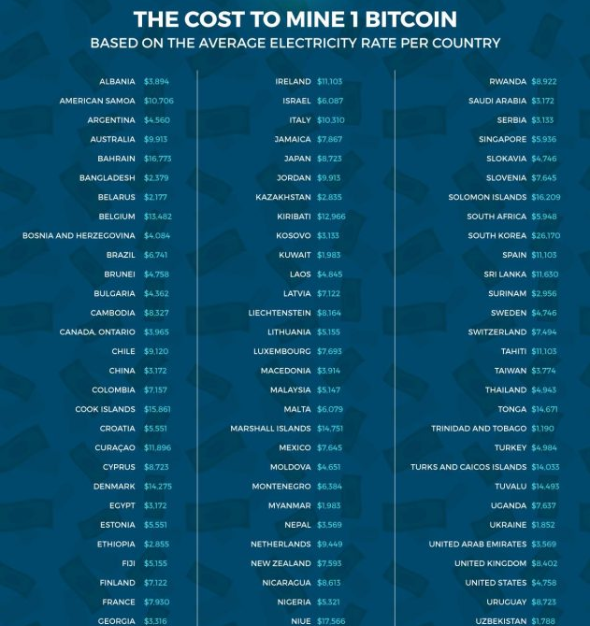 Other countries like China, Canada, Albania, Bangladesh, Egypt, Ethiopia, and India costs between $3,000 and $3,500 to mine 1 Bitcoin, which is just right at the break even point. Compared to South Korea that costs $26,170 to mine a single BTC, it’s undeniably a very good deal. To conclude, it’s not always unprofitable to mine crypto during the bear market. It only needs the "right place" to do so, while waiting for the bull to come and get the price to soar high again. Are you still interested in mining crypto during the bear market? Yes, I'll move to those countries with cheap electricity. Nah, I'll wait for the bull run before starting to mine again. I'm never interested in mining crypto ever.